Spring is one of the most unpredictable times of the year for weather in Portland. To be honest I’m not a fan of the month of March. My entire life it seems that I’ve been working outside in this month of lions and lambs. As we transition from a very weak La Nina (one that barely made its presence known) to our baseline or No nino all of the forecasts have honed in on one similarity. We are in for a very NORMAL spring. That means we can expect cool showery periods interspersed with warmer and drier and back again. These are normally 2 week time spans where we flip between the two regimes and as the year wears on warmer and drier eventually wins until we enter our annual dry season in June. Things can always change and we’ll be watching for any anomaly. January 2018 was the second warmest of all time and in this era of advancing climate change it seems that we can expect extra warm months on a regular basis. That having been said the NOAA is still firmly avowed that our spring will be normal. Our waning La Nina’s cooler and wetter hangover should be long gone by the middle of this season. BTW Meteorological seasons are slightly different than the equinox. March, April, May is officially spring for the weather service and June, July, August- yep- you guessed it, meteorological summer. For the past 6 months the National Weather Service has been keyed in on the summer of 2018 as a scorcher. 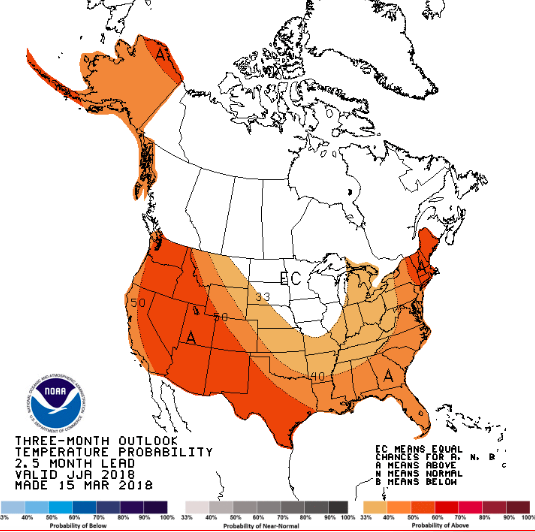 While seasonal forecasts for last winter to this spring have nudged all over the place one thing has remained constant and that is above normal temperatures for all of next summer. Facts have shown we are consistently having warmer summers. Its been just one year out of the last 10 where we haven’t exceeded our annual average of 14 days above 90ºF. In fact in some recent years we’ve doubled that number (2015 29). And last year’s 24 days fell right in with that trend. Other more subtle changes in our summer weather are creeping in as well. The number of overnight lows above 60ºF in the Portland Metro has been steadily increasing for the past 15 years. Its odd to not break a record now for most summertime lows above that point. This is a subtle difference that we don’t really record with our bodies. Its daytime high heat that bowls us over, that we remember. And we’ve gotten so used to hot summers that last year two important heatwaves have blurred into one long hot mass of heat. On June 25, 2017 we recorded the second hottest temperature ever achieved in that month 101ºF- which was also the hottest the earliest we have ever recorded. And on August 3rd we topped out at 105ºF- the 10th hottest day ever recorded at PDX. Seems monumental but in reality we are so used to hotter than normal conditions we barely even take note. So, its amazed me that the forecast by the NOAA climate service for summer 2018 has been so consistent. 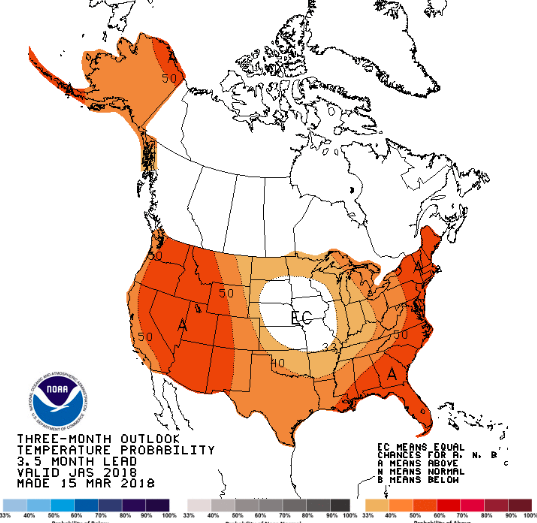 From late spring to early Autumn much above normal temperatures have been predicted over and over. Here’s the forecast for May, June, July. ‘A’ on this map stands for above normal and depth of the color indicates intensity. (EC stands for even chances- another way of denoting normal climate.) Check out how much of North America is above normal. July, August, September 2018 (below) Virtually no change- Consistency! Climate forecasts are subject to change at any time and this is not 100% set in stone. But two things make me believe this is worth paying attention to. First, this forecast has remained unchanged for the past 6 months. In forecasting consistency for the long haul is everything. Generally the farther out in time the forecast the broader the prediction and the more subject it is to change. This kind of consistency is surprising. If it were predicting temperatures this consistently below normal I would be screaming Little Ice Age- to put it in perspective. So this should make us take notice. As a nursery owner it makes me think of several things. Water use will be much higher. Drought stress exacerbated by heat will haunt our gardens. Normally we go several years at least between scorching summers. But this consistently hotter summer regime seems to be sticking with us. Its more than just a trend- its our new reality. And if these facts don’t convince you our summers are getting warmer- snack on this fact: observed record high temperatures in the U.S (and around the world) have outpaced record low temperatures by a factor or 18:1 in the last 50 years. Thats significant and its a hard fact. What can you do to prepare for a possible 2018 prolonged inferno? First, if you mulch every few years this would be the year to do it. Compost, bark, etc. Mulch evens out the soil temperature, lowers the escape of moisture and generally puts much less stress on plants. For mesic (water loving plants) put yourself on an irrigation schedule. Remember it is more beneficial to water deeply and infrequently, than it is to water short and shallow. Plan on irrigating water loving plants thoroughly BEFORE a heatwave. This hydrates the roots and whole plant in advance and it is easier than watering during a heatwave- its also much more pleasant and efficient. And it slows down the activity of many soil root pathogens which are normally most virulent with soil temperatures between 55º-80ºF in moist conditions. For newly installed plants- including drought tolerant plants its important that you water them consistently through all of summer – this lessens stress as well as aids in more rapid establishment- the bigger the root system the less stressed the plant will be. One bit of good news: Tomatoes and Peppers are going to adore this predicted trend. So while you are sweating it out you’ll at least be enjoying vine ripened fresh produce in abundance. So, I’ll be paying close attention to this forecast for any significant changes. And there could be- but I keep going back to the remarkable consistency. We’ll have to wait and see. Thank you so much for this very informative article. I was already planning on ordering trail mix and leaf compost for mulching. This cinches it! Thank god for A/C, and the fact with a mild winter I won’t be planting a lot of new, needy, plants this spring. Could you please get a gig on one of the local news channels because you’re talking about what no meteorologist on TV ever mentions: climate change. It’s real, it’s here, it’s too warm, and we need to be talking about it. I -and all my planties- appreciate your tips on preventive care.